I’ve been away from this 6×6 project for awhile, so today I approached the subject as if painting it for the first time. I noticed there were some warm reds and violets in the background trees that I hadn’t included before, I think adding them created more depth than on some of my previous paintings of this scene. One of the great challenges of two dimensional art is making a flat painting look like the scene recedes away from the viewer. The sense of depth in a landscape painting is partly achieved by using a technique called atmospheric perspective. If you look at a view with distant background, you might notice a slight perception of haziness as you look farther back. Also, the colors usually appear slightly bluer (cooler) and lighter as the distance increases. Physics can explain these effects, but an artist mostly just needs to be aware of it. In this painting, the reds in the background are a little warmer than the foreground greens, but cooler than the yellows. By adding a thin layer of blue-violet over the reds the sense of depth is effective. There are other techniques for creating the illusion of depth. I’ll try to point some of them out as I complete paintings that are good examples. Whew! Painting number 6 in the planned Portage Island Cliff 6×6 series of 36 paintings–one row of the 6×6 completed! Can get this project done before Studio Tour on Labor Day Weekend? Stay tuned! 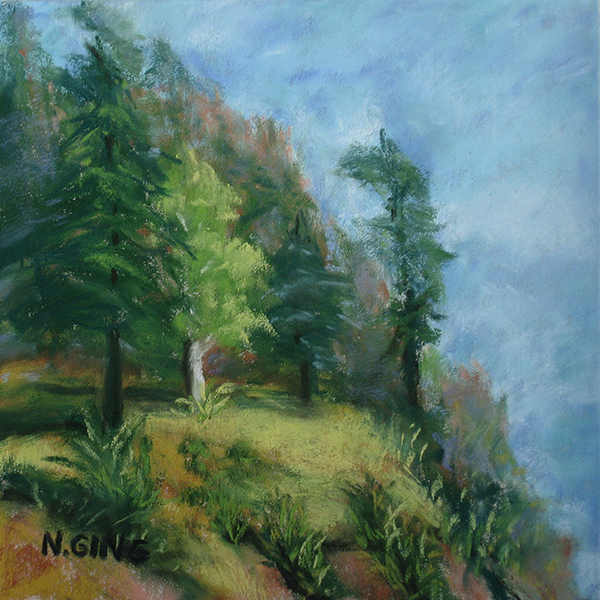 Click here to see all pastel paintings in the Portage Island Cliff 6×6 Series. Filed under Blog. Tagged 6x6 series, atmospheric perspective, color temperature, pastel paintings, Portage Island Cliff.